Water is a unique substance. It can exist as a liquid, solid (ice), and gas (water vapor). A primary way water vapor increases in the atmosphere is through evaporation. Liquid water evaporates from oceans, lakes, rivers, plants, the ground, and fallen rain. A lot or a little water vapor can be present in the air. Winds in the atmosphere then transport the water vapor from one place to another. Most of the water vapor in the atmosphere is contained within the first 10,000 feet or so above the earth's surface. Water vapor also is called moisture. Absolute humidity (expressed as grams of water vapor per cubic meter volume of air) is a measure of the actual amount of water vapor (moisture) in the air, regardless of the air's temperature. The higher the amount of water vapor, the higher the absolute humidity. For example, a maximum of about 30 grams of water vapor can exist in a cubic meter volume of air with a temperature in the middle 80s. SPECIFIC HUMIDITY refers to the weight (amount) of water vapor contained in a unit weight (amount) of air (expressed as grams of water vapor per kilogram of air). Absolute and specific humidity are quite similar in concept. Relative humidity (RH) (expressed as a percent) also measures water vapor, but RELATIVE to the temperature of the air. In other words, it is a measure of the actual amount of water vapor in the air compared to the total amount of vapor that can exist in the air at its current temperature. Warm air can possess more water vapor (moisture) than cold air, so with the same amount of absolute/specific humidity, air will have a HIGHER relative humidity if the air is cooler, and a LOWER relative humidity if the air is warmer. What we "feel" outside is the actual amount of moisture (absolute humidity) in the air. Meteorologists routinely consider the "dewpoint" temperature (instead of, but analogous to absolute humidity) to evaluate moisture, especially in the spring and summer. The dewpoint temperature, which provides a measure of the actual amount of water vapor in the air, is the temperature to which the air must be cooled in order for that air to be saturated. Although weather conditions affect people differently, in general in the spring and summer, surface dewpoint temperatures in the 50s usually are comfortable to most people, in the 60s are somewhat uncomfortable (humid), and in the 70s are quite uncomfortable (very humid). In the Ohio Valley (including Kentucky), common dewpoints during the summer range from the middle 60s to middle 70s. Dewpoints as high as 80 or the lower 80s have been recorded, which is very oppressive but fortunately relatively rare. While dewpoint gives one a quick idea of moisture content in the air, relative humidity does not since the humidity is relative to the air temperature. In other words, relative humidity cannot be determined from knowing the dewpoint alone, the actual air temperature must also be known. If the air is totally saturated at a particular level (e.g., the surface), then the dewpoint temperature is the same as the actual air temperature, and the relative humidity is 100 percent. Transpiration - Plants take in water in their root systems and release it into the atmosphere through their leaves. Evaporation - Water is converted to vapor phase from the ground or a body of water and mixes with the atmosphere. Evaporation accounts for approximately 90% of water vapor, and transpiration accounts for 10% of water vapor. Water vapor is a natural and very important component of the Earth’s atmosphere. Its distribution influences many physical and chemical properties of the atmosphere, including weather, clouds, precipitation, lightning generation, convective uplift, and the Antarctic ozone hole. Water is constantly cycling through the atmosphere. Water evaporates from the Earth’s surface and rises on warm updrafts into the atmosphere. It condenses into clouds, is blown by the wind, and then falls back to the Earth as rain or snow. This cycle is one important way that heat and energy are transferred from the surface of the Earth to the atmosphere, and transported from one place to another on our planet. 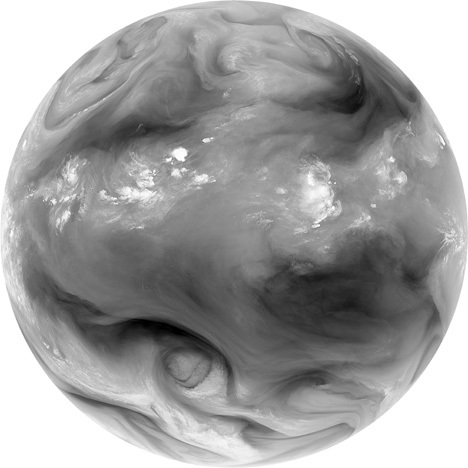 The water vapor image show an infrared band which is affected strongly by the presence of water vapor. Essentially, the image shows the altitude of the highest moist layer in the atmosphere. Bright areas reflect the location of high clouds either due to jet stream cloudiness or due to thunderstorm activity. The dark areas reflect the location of dry air at high altitudes. This is associated with dry air intrusion and sinking motion associated with high pressure systems. This image is a decent tracer of jet stream winds which will show up as bright streaks. Water vapor is also the most important greenhouse gas in the atmosphere. Heat radiated from Earth’s surface is absorbed by water vapor molecules in the lower atmosphere. The water vapor molecules, in turn, radiate heat in all directions. Some of the heat returns to the Earth’'s surface. 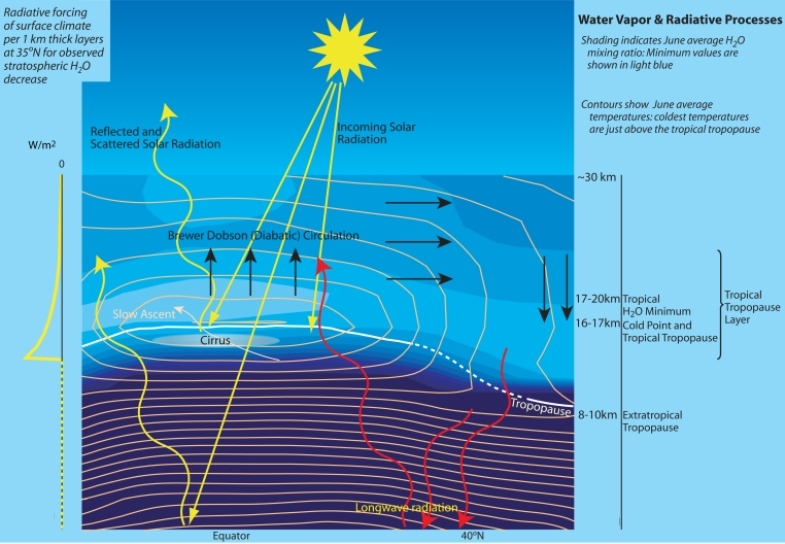 Thus, water vapor is a second source of warmth (in addition to sunlight) at the Earth’s surface. Despite its importance to atmospheric processes over a wide range of spatial and temporal scales, water vapor is one of the least understood and poorly described components of the earth's atmosphere. As the temperature of the atmosphere rises, more water is evaporated from ground storage (rivers, oceans, reservoirs, soil). Because the air is warmer, the absolute humidity can be higher (in essence, the air is able to 'hold' more water when it's warmer), leading to more water vapor in the atmosphere. As a greenhouse gas, the higher concentration of water vapor is then able to absorb more thermal IR energy radiated from the Earth, thus further warming the atmosphere. The warmer atmosphere can then hold more water vapor and so on and so on. This is referred to as a 'positive feedback loop'. As water vapor increases in the atmosphere, more of it will eventually also condense into clouds, which are more able to reflect incoming solar radiation (thus allowing less energy to reach the Earth's surface and heat it up). Water vapor accounts for the largest percentage of the greenhouse effect. With new observations, the scientists confirmed experimentally what existing climate models had anticipated theoretically. The research team used novel data from the Atmospheric Infrared Sounder (AIRS) on NASA’s Aqua satellite to measure precisely the humidity throughout the lowest 10 miles of the atmosphere. That information was combined with global observations of shifts in temperature, allowing researchers to build a comprehensive picture of the interplay between water vapor, carbon dioxide, and other atmosphere-warming gases. The NASA-funded research was published recently in the American Geophysical Union's Geophysical Research Letters. "Everyone agrees that if you add carbon dioxide to the atmosphere, then warming will result,” Dessler said. “So the real question is, how much warming?" The answer can be found by estimating the magnitude of water vapor feedback. Increasing water vapor leads to warmer temperatures, which causes more water vapor to be absorbed into the air. Warming and water absorption increase in a spiraling cycle. "The difference in an atmosphere with a strong water vapor feedback and one with a weak feedback is enormous," Dessler said. Climate models have estimated the strength of water vapor feedback, but until now the record of water vapor data was not sophisticated enough to provide a comprehensive view of at how water vapor responds to changes in Earth's surface temperature. That's because instruments on the ground and previous space-based could not measure water vapor at all altitudes in Earth's troposphere -- the layer of the atmosphere that extends from Earth's surface to about 10 miles in altitude. “This new data set shows that as surface temperature increases, so does atmospheric humidity,” Dessler said. “Dumping greenhouse gases into the atmosphere makes the atmosphere more humid. And since water vapor is itself a greenhouse gas, the increase in humidity amplifies the warming from carbon dioxide." "That number may not sound like much, but add up all of that energy over the entire Earth surface and you find that water vapor is trapping a lot of energy," Dessler said. "We now think the water vapor feedback is extraordinarily strong, capable of doubling the warming due to carbon dioxide alone." Because the new precise observations agree with existing assessments of water vapor's impact, researchers are more confident than ever in model predictions that Earth's leading greenhouse gas will contribute to a temperature rise of a few degrees by the end of the century. "This study confirms that what was predicted by the models is really happening in the atmosphere," said Eric Fetzer, an atmospheric scientist who works with AIRS data at NASA's Jet Propulsion Laboratory in Pasadena, Calif. "Water vapor is the big player in the atmosphere as far as climate is concerned."